General Motors recently launched a new social collaboration experiment called LAB. 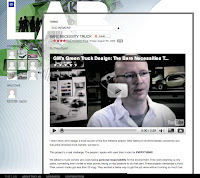 It sets out to gain insights from web users who are interested in the design direction and future product innovations GM is planning. It’s basically a glimpse into the design studio where concept vehicles are currently under development. An introduction video from GM’s Manager of Advanced Design Wade Bryant shares that “The Lab is to share these ideas with a broader audience… to have an open dialogue.” This assumes that the open dialogue will further shape the end conceptual design and that GM can later claim that “x” concept vehicle was built with consumer input via The Lab’s collaborative environment; thereby, creating a better end product. All of this reminds me of Herbert Powell, the brother of Homer Simpson, who exclaims, “I want you to design a car for all the Homer Simpsons out there.” He then gives Homer the opportunity to design a new car that would be devoid of the failings of an insular corporate culture that had become disconnected from the needs of the “Working Man.” Homer becomes the persona for all the needs and wants of that common man which ultimately leads to the unveiling of a new $82,000 car that shutters the company as its final effort to get things right only to have everything come to a bitter, misdirected end. To be fair, GM's LAB doesn’t trust one person to make every decision; instead, it uses more of a crowdsourcing approach that seeks the inputs from many to find some consensus or unique ideas that may not have come from the internal corporate design team. One company has applied the crowdsourcing model in automotive design to a much more radical interpretation and that is Local Motors. Local Motors is a very interesting experiment and is undergoing the real development of their Rally Fighter product, an off-road desert racer housing a BMW diesel engine. The Rally Fighter looks like what a Chevrolet Vega might have looked like today if it were to undergo decades of minor updates, you mounted a cluster of KC lights to the grille, and then gave it the ground clearance of some farm boy football player’s pickup truck. It’s a design only crowdsourcing could be proud of, definitely not a vehicle for mass appeal. But I think LAB has little to do with true input into automotive design and more to do with perception. It shows that General Motors is listening to what most people criticize it for – not building what people want to drive. So, if you listen and open input from anyone with a computer and the ability to complete a simple registration form, no one can complain that GM is not building what people want. Funny thing is, design isn’t GM’s issue as it has recently designed some very impressive vehicles lately: the new Camaro, GMC Acadia, Saturn Sky, Pontiac G8, Cadillac CTS and the new Chevy Malibu. Design isn’t the issue. The issue is people having a concern with long-term quality of American products and having little reason to switch from their favorite, reliable Asian car that meets their needs. GM's LAB addresses nothing about quality, nor should it. The LAB instead is a Public Relations move to show that GM is listening and adjusting to consumer input. I’m sure The Lab will affect future concepts so someone can point to the success of the project, but if this was really about collaboration to drive vehicle design The Lab would be more focused in its conversational execution. What I mean by that is the feedback on a vehicle would be topical and focus on particular elements of the design instead of being the free for all comment thread that is currently under each design study. If we look at Local Motors and how they foster discussion, they host a Forum area that looks at unique steps across the vehicle development process. Discussions around design studies, chassis, wheel size, and other vehicle attributes focuses the commentaries around distinct areas that can be elaborated on further. Plus the Local Motors execution attracts vehicle designers instead of just the common workingman, allowing for less cheerleading for a brand and more serious commentary on design. So in the end it’s essentially a Public Relations move to show GM is listening to those who criticize its vehicle development decisions. Whether it nets any real design impact will be purely accidental. Thanks for taking the time to blog about the LAB. I’ll be the first to admit that the LAB itself is an experiment for us – and there’s more to it than what we’ve displayed so far. We did talk about different ways to organize the feedback, but settled on a simple Wordpress blog because of how easy (cheap) it was to get started. We can always change later. Plus, you’ll see real surveys happening on the site soon, and LAB contributors will join others to make sure we get a true representation. I’d only be worried about the Homer Simpson outcome if we were entrusting the LAB as our only source of information and if Homer was our only commenter. Actually, if we do get to work on a production Bare Necessities Truck, for example, we may decide not to engage on the LAB about the details. Our other research methods can gather customer input and still keep the project confidential until reveal. The idea to do the LAB came from my cross-functional Design Strategy Team comprised of Design, Engineering, R&D, and Product Research. Like you pointed out, we were aware of criticisms that we don’t listen to customers enough – what hurt most was that we DID spend lots of time and money listening, but that it was a big secret. This site gives us immediate feedback, versus our typical ethnographic research studies that only happen once or twice on a given project. We’ve already reconsidered a few aspects on the two concepts we’ve shared. There are always options, and it has been surprising seeing the extreme differences in focus between the car and truck even though they both sprung from the same “less-is-more” approach. Reading the blog comments has kept my mind nimble and open to different customer desires. It has also boosted our confidence that we’re onto something good. We’re just out of the gates with the LAB. So far I can see the upside with no serious downside. I also realize we’ll have to prove it for you to believe me. That’s OK, we will. Kudos to Wade Bryant & GM - this is a great step forward! Wade, if you are interested in expanding the GM community's ability to contribute and collaborate, you could look into NING; it's a low cost and customizable way to build a social network. As you build a community, whether with a blog, Twitter, Ning-whatever, you will feel as if your job is never done. This will be an invaluable experience, and I applaud you for starting. Local Motors sometimes gets feedback about the "Homermobile", but eventually the reference dies down (at least until now-thanks, Chris!). While we are here to listen to our customers and community, we are not here to build a car for everyone-nor are we here to implement everyone's ideas (a la homermobile). There is a certain amount of bimodal intelligence that needs to be incorporated into vehicle choice, and feature incorporation. The company's first job is to listen (intelligence from the community), realize, then act and choose a direction (intelligence from the company). Once a specific direction is chosen it is much easier to understand which features or design ideas should be incorporated. Wade- We wish you luck & congratulations! Wade I am looking very forward to the evolution of the LAB and am excited to hear how you find value in the site, even in the raw introductory form that it is today. Like I said in my post, I realize no one at GM or Local Motors is designing with input from one lazy, lethargic, balding man. But it is interesting in both implementations that input from anyone is (can) affect design and this can be good or bad, just like any design by committee, but Wade your comments on when to move back to more traditional research methods makes perfect sense and is refreshing to hear. Thanks to you both for your leadership on community based design and it's great seeing how this technique evolves. Engineering and Quality control are GM's problem. Anyone can sketch a great looking initial design. But with all the feedback GM is getting it's not listening to the most important feedback - the consumers who decided to buy a Toyota or Honda instead of a GM car. GM is marketing too many cars and too many brands to the same potential customer. This is still going on. The Malibu is talked about as being such a great car. But the reality is it feels unintentionally retro - like an old cadillac, it's not wide enough, the roof is too low, the trunk is too small, and the suspension is not tuned sporty enough. other then those criticisms, it's a great car. THERE IS NOTHING NICHE ABOUT THE RALLY FIGHTER. JACK UP A CAMARO AND GIVE IT FOUR WHEEL DRIVE SO IT DOESN'T BOTTOM OUT ON A CURB OR SCRAPE THE GROUND EFFECTS ON A STEEP INCLINE AND EVERYONE WILL BUY IT. IT IS STUPID TO SAY THAT IS NICHE. THAT IS SMART AMERICAN DESIGN. OF COURSE, CERTAIN THINGS WILL HAVE TO BE MODIFIED. THE INTERIOR WOULD HAVE TO OFFER ALL THE STANDARD CREATURE COMFORTS. BUT I WOULD SOONER BUY THIS HYPOTHETICAL VEHICLE OR SOMETHING LIKE IT THEN I WOULD BUY A 2010 EQUINOX OR TERRAIN. I WOULD EVEN BUY A HUMMER H4 (HX) BEFORE EVER BUYING A DAMN EQUINOX NO MATTER WHAT THE FUEL ECONOMY IS ON THE EQUINOX. (THEY MAKE A CAR ALL-WHEEL-DRIVE AND THEN THEY GIVE IT LOW ROLLING RESISTANCE TIRES (LOW TRACTION). THAT IS JUST PLAIN DUMB. The Rally Fighter is niche, but that isn’t a bad thing. Whether or not you love the design of the Rally Fighter, it has very limited appeal. When it gets built it will certainly have an appeal to those who want such an unique car and those who enjoy it from a purely aspirational perspective, but the Rally Fighter will never be a mass produced product. It is just too odd and limited in its appeal for mass consumption, but so are a lot of great cars. Niche by no means implies a vehicle is not great. Many of my favorite sports cars are extremely niche - a Koenigsegg CCX and a Pagani Zonda to name a few. I think your rant against the Chevy Traverse, which is an okay car but fails to excite me too, and praise for the Rally Fighter shows how exciting a diverse car market is. I think you and I would agree that a market with only Russian Trabants would be down right miserable. Just to be clear, I am personally happy to see companies like Local Motors in the industry as I think they push automotive design into some compelling areas. Plus, while critical of a crowdsourcing automotive design model, I think it still has value in many ways similar to what Wade mentioned above about getting input that might not have been found through more traditional research methods. There seems to be alot of talk about design, but my concern is COLOR. I cannot find a used blue cadillac with front wheel drive anywhere. I also look for a bench seat in front and plenty of leg room in the back seat. We provide Remanufactured and Rebuilt automobile Engines For diesel engines, marine engines, import engines transmissions ,auto, boat, truck, cars, SUV, Pickup and many more. Thanks for the post - I remain skeptical but will check out the LAB. In my experience these type of schemes make good PR machines but seldom is any of the input acted upon. i am Totally impressed thanks for sharing,great post.